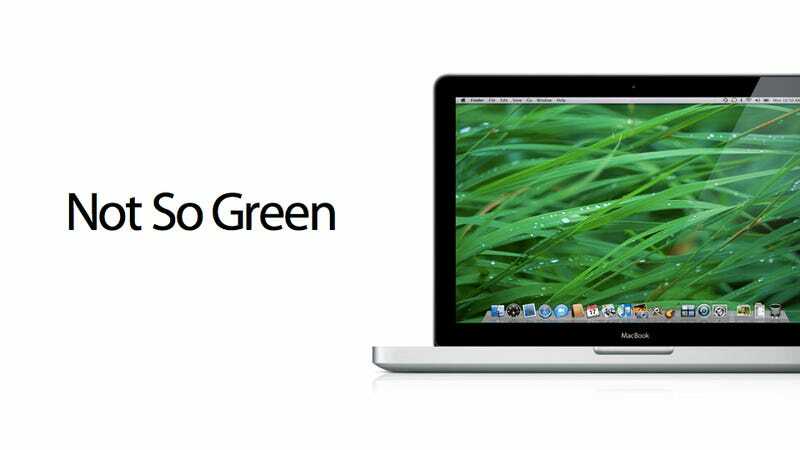 Though Apple typically lauds itself for being green, it has decided to stop adhering to environmentally friendly standards. According to the Electronic Product Environmental Assessment Tool (EPEAT), the standard for green consumer electronics, Apple has pulled all 39 of its computers from being certified green by EPEAT. The purpose of EPEAT is to lessen the negative environmental impact of making electronics by requiring companies to meet eight different environmental-focused categories like a product's lifetime, toxic materials, recyclability, etc. It's a good thing. And it's a pretty big thing that Apple doesn't care about EPEAT anymore because all of its computers since 2007 have been EPEAT Gold Certified. "They said their design direction was no longer consistent with the EPEAT requirements. They were important supporters and we are disappointed that they don't want their products measured by this standard anymore." Update: Many cities, government offices and schools require their computer purchases to be EPEAT certified. By pulling their computers from EPEAT, Apple is effectively making them buy other computers in bulk. It could lead to Mac-friendly schools becoming well, less Mac-friendly.